When a bit of solitude is needed or when I would just enjoy a change of scenery while fishing, I often find myself at an under-fished spot at the estuary system behind Crane Beach known as the Castle Neck River. From May to September, this spot holds Striped Bass from schoolie size up to 40 inches or more. On any given day the typical Striper will run between 18 to 28 inches. In addition, Bluefish will often invade these waters during these same months and provide some great top water action. 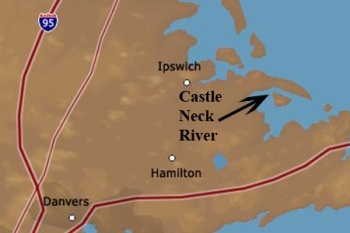 Castle Neck is a reasonably protected area so unless there are unusually windy conditions this spot will have virtually flat water. At dawn and in the early morning fish can be seen actively feeding at or near the surface. 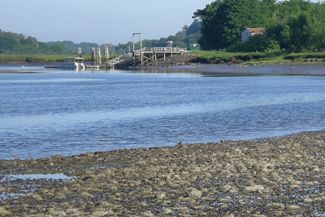 It is not unusual to see breaking fish in many spots all along the estuary. When this happens, fishing can get to be rather exciting with resulting fish counts well into double digits. Flat water with fish feeding near the surface means I will be using top water lures 99% of the time. I will use these opportunities to hone my top water fishing skills using small poppers, pencil poppers, and jumping minnows. On rare occasions I will switch to rubber baits such as bass assassins. In the dim light of pre-dawn you may get the sense that even though you are the only human type creature fishing this area you may feel the weight of other sets of eyeballs on your shoulders. Take the time to look around once and a while and you will see white tail deer, coyotes, wild turkeys, the ubiquitous skunk and a variety of other denizens of the marsh and woodlands giving you the once over. Of course along with the wildlife comes other unwanted types of creatures such as ticks and mosquitoes so be prepared with your repellents and stay out of the brush. 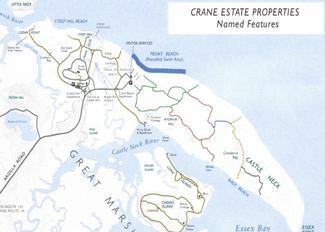 To get there, follow the directions on the Crane Beach web site. 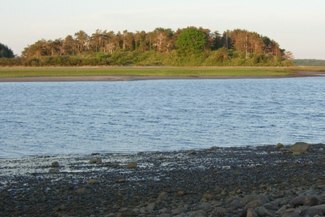 From the overnight parking area outside the main gate, it is a twenty minute walk to the old Ferry Landing on the Castle Neck River. Make sure you apply plenty of mosquito repellent. From 8 AM to 7 PM you must park in the main Crane Beach lot. However, these are not your typical fishing hours so you may need to go the Ipswich town hall and obtain an overnight parking sticker that will cost you 15 dollars and allow you to pull into one of the overnight spots. Overnight, fisherman parking is allowed from 7PM to 9AM in a small dirt lot near the main gate for Crane Beach.